According to director Conrad Bishop, his "professional connection" to Shakespeare's Tempest has become more than just professional. After working for over a year on an innovative puppet-driven interpretation of the fantasy-island favorite, Bishop admits that The Tempest has officially become an obsession. "I was never that interested in The Tempest," he explains, taking a short break from rehearsing at his Sebastopol studio. "The only Shakespeare I've directed up until now is Macbeth, a show we did for many, many years, but when I started thinking about The Tempest, I realized that the challenge would be working out a real and true ending that involves forgiveness, rebirth and resurrection. When the Sonoma County Repertory Theatre suggested co-producing a version of The Tempest well over a year ago, it restarted that whole thought process. In 40 years of theater, this is the most time I've ever spent on a project." The Tempest, which opens a five-week run at the Rep starting this weekend, is both typical and atypical for Bishop, whose Independent Eye troupe has built a reputation for innovative and visually stunning adaptations of classical stories and myths. With this uniquely eye-popping take on Shakespeare's story, Bishop is collaborating with the Rep's dependable stable of actors, most of whom (Dan Saski, Benjamin Stowe) have never worked with puppets to such an advanced degree. 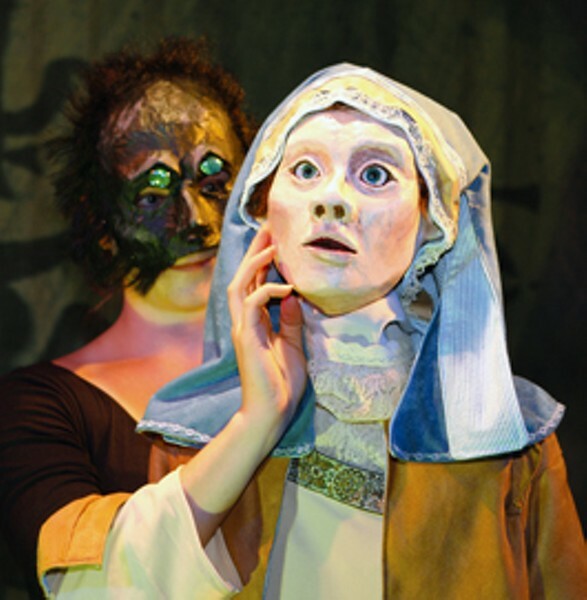 Adding to the challenge, Bishop's style of performance requires the actors to be masked, forcing them to express through subtle movements the range of emotions they traditionally convey through facial expression. "The style we use," Bishop explains, "employs characters with heads that are life-size and bodies at three-quarter size. The actor's hand goes into the head, so the actor's wrist becomes the neck. It's a very visceral style, in terms of gesture and movement, and it demands that the actors learn a whole new kind of physicality. "Finding that relationship between movement and gesture," he continues, "is a very complicated thing for some actors. The puppet is dead if it's not moving, so for the actor, finding out how much movement is essential is vital." Bishop says that the Rep actors have demonstrated a particularly strong aptitude for this hyperdetailed brand of puppet manipulation. Having worked with first-timers often, Bishop is proud of how far the actors have come in such a relatively short time. "Some actors never find the channel through to the immense power of the puppet," he says, "but everyone seems to be really enjoying it. This kind of advanced, full-body puppetry forces you to embrace an intense simplicity of movement. I believe they will all discover that this process has made them even better actors." In addition to the performances at the Rep, The Tempest will tour several local high schools, an effort made possible by a grant from the National Endowment for the Arts. Another fascinating side project to the development of the show is the online blog (Bishop calls it his "Survival Log") that chronicles his own thoughts and artistic evolution throughout the process of bringing The Tempest to life. "I've thought for years about trying to chronicle my projects in some way," he remarks, "trying to tell with electrons the story of how we make a show. With The Tempest, the blog has been very useful in forcing me to think about what's going through my mind. I often start writing, and I think nothing much has been on my mind, but then I learn, after a few minutes, that I have, in fact, had quite a lot on my mind. Blogging has been very interesting and incredibly valuable. I've discovered that, aside from the self-expression it makes possible, blogging is, at its heart, a process of intense forced objectivity. It's a magical thing for an artist—and I don't think it's just because I'm creating a show about magic and wonder."